The mission of VSAH is to promote activities benefiting Vietnamese students in Hawaii, to build a network among VSAH alumni, and to promote community and students’ awareness of Vietnamese culture. Further VSAH aims to foster interaction and partnerships with Vietnamese student associations of other Universities and the Vietnamese American community in Hawaii. The mission of VSAH is to promote activities benefiting Vietnamese students in Hawaii, and to build a network among VSAH alumni, and to promote community and student awareness of Vietnamese culture. Further VSAH aims to foster interaction and partnerships with Vietnamese student associations of other universities and the Vietnamese American community in Hawaii. Nau banh dem xuan (Cooking on New Year’s Eve) is a traditional folk song ‘Vong co’, composed by Quy Sac. It is one of the most famous, romantic and lyric songs in the south of Vietnam about dating in daily working life. They’ll start with the Vietnamese southern folk song then perform the Vietnamese fan dance. The fan dance represents the homeland kites. For a long time, kites have always been a close image with Vietnamese people. Kites in Vietnam are the most powerful symbol of strength, success and freedom. 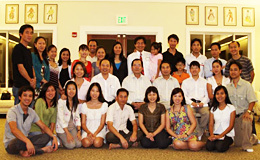 The Vietnamese Student Association in Hawaii (VSAH) is the Ohana of students from Vietnam in Hawaii. 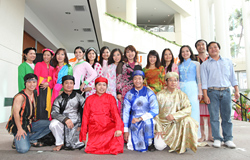 One of its missions is to promote community and student awareness of the Vietnamese culture, country and people. 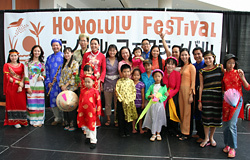 For this reason, the association has fostered and participated in various cultural exchange activities in Hawaii.